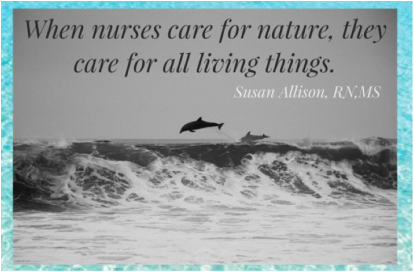 Susan Allison is a master's degree-prepared, advanced holistic certified nurse who practiced for several years as a wound, ostomy, continence clinical nurse specialist. In 1999, she felt an intuitive pull to leave hospital, disease-model nursing and explore her passion for nature. Her new path led her to expand her knowledge of horticulture including working at a garden center and doing an organic internship at Highgrove Estate, private home to Prince Charles. She explored Caribbean islands, where she got to know whales and dolphins personally in the wild as sentient beings. This led her to volunteer to educate about and advocate for issues affecting cetaceans. Noticing a transformative restoration in herself from being in nature, she started practicing as a holistic nurse-looking at health and wellness from a much wider lens. Susan created a garden shop in order to introduce more people to nature and it's healing power. Nature holds a central theme to her debut novel series, I Know You're There & By The Sound Of The Crow. You can learn more about her writing on her author page, SusanAllisonDean.com. The Nature Nurse is the latest step of her journey to connect with, enjoy, heal from and protect nature, not just for herself, but anyone who wants to join her. To learn more, sign up for her weekly blog.